The Vega - now also as Evo model - with 3D-feets for perfect force absorption and integrated screw attachment. New superlight mouting parts for alternative mounting of the stays to the frame. Optional: click springclamp. Weight limit and mounting plate? What's the carrying weight capacity of the rack? How heavy is the rack? 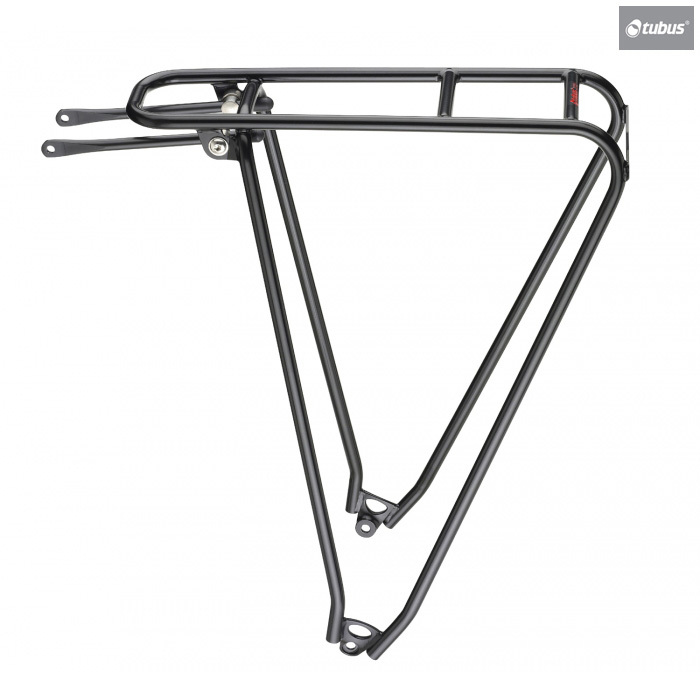 Does it have a mounting plate to attach a rear light to the rack? Does it fit thru axel? The max load of this rack is 25kg and the rack itself weighs 522g. It does indeed have a mounting plate at the rear and unfortunately this is only compatible with QR skewers. If you are looking to know if those panniers will fit, the answer is yes. What is the difference between this rack and the classic version. Is one model preferable over the other. The only difference is at the dropouts, the Evo uses "3D" feet for perfect force absorption and integrated screw attachment. These feet however will limit compatibility with certain frames and can't be used with Tubus' rack extenders or quick-release conversion kit.